How's Your Day? 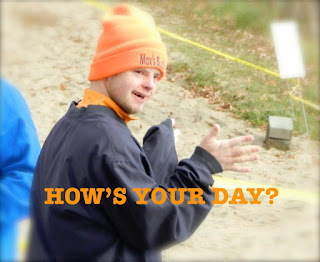 Special Olympian Max Jackoski Wants to Know! Lake George's own Special Olympian Max Jackoski has started a Facebook page to help spread his brand of kindness beyond the shores of the southern Adirondacks. Jackoski and his mother Lisa are more than just mother and son, but a team that can inspire others to make someone's day a little bit happier. Today’s special video highlights World Down Syndrome Day, which takes place every March 21. The reason this specific date was chosen was to draw attention to the triplication of the 21st chromosome, which is the cause of Down syndrome. Since 2006, March 21 has been recognized by the United Nations as a united effort for inclusion, support equal rights, and the well-being of people with Down’s Syndrome. With a new video to create awareness and support for the opportunities that all people with Down syndrome bring to their communities, Max’s March 21st video highlights his own joyful life. Lisa feels that there are also some unexpected results with the video blog process. The page upkeep has been a learning tool in many ways. Max has been able to practice the words he writes down so it’s become a form of self-correction. She has also been able to teach him about Internet safety and being appropriate online. What is next for Max? His How’s Your Day page will continue to be his own entity as he explores unique calendar days. His schedule will remain full with work and training for the upcoming Special Olympics. Lisa’s advice on parenting is pretty holistic as she navigated Max’s biological and emotional needs. Her advice to other parents is simple, just keep trying new and different things. Sometimes it will connect with your child and sometimes it won’t. There have been a lot of things that didn't work, but she just kept trying. To follow Max’s page click here where you go can learn about various activities and what is happening in his life and community. Lisa has been asked if the page would ever become a a fundraising vehicle for Special Olympics or the Lake George Polar Plunge group, Max’s Buddies.